Sadly, I had been afraid of giving current furniture a makeover until now. I was worried it would be hard, so instead I built new (my logic is sometimes odd I know). But last month I worked on remodeling my entire office & craft room for only $100 with the $100 Room Challenge so I needed to save money and reuse the furniture I already had. 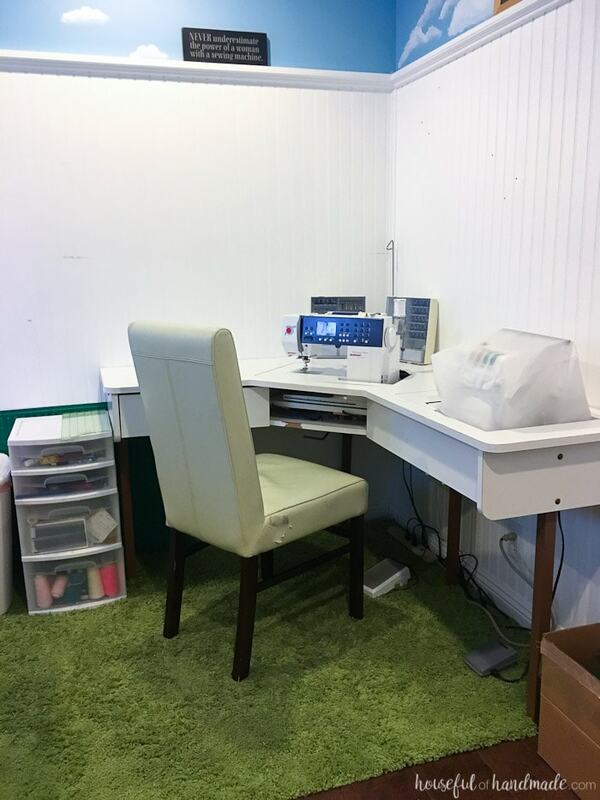 Now I am so excited to try my hand at redoing some other furniture in my house because I absolutely love how my Sewing Machine Table Makeover turned out. I was lucky enough to be given this sewing machine table from my mom a few years back. She bought it over 25 years ago. I remember learning to sew at this table. And I love that it has a place for my sewing machine and my serger. What I didn’t love was that the desk was super utilitarian and not pretty at all. 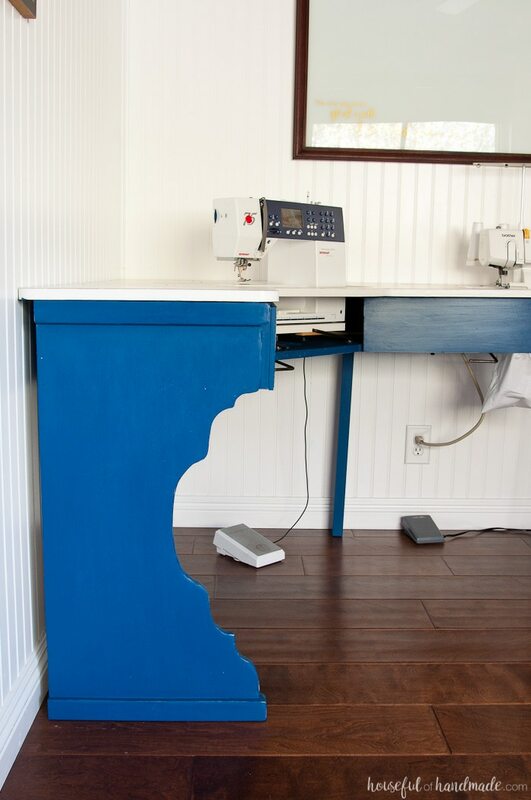 The thing I hated the most about the sewing machine table was the legs! Seriously, it looked like they designed the table then realized they forgot to add legs. So they hurried and stuck the ugliest posts on the ends and the back to hold it up. It was sturdy enough, but if one of those ugly brown posts was loose or on uneven ground, it got really wobbly. I knew the only way to make the sewing machine table better was to replace those legs. 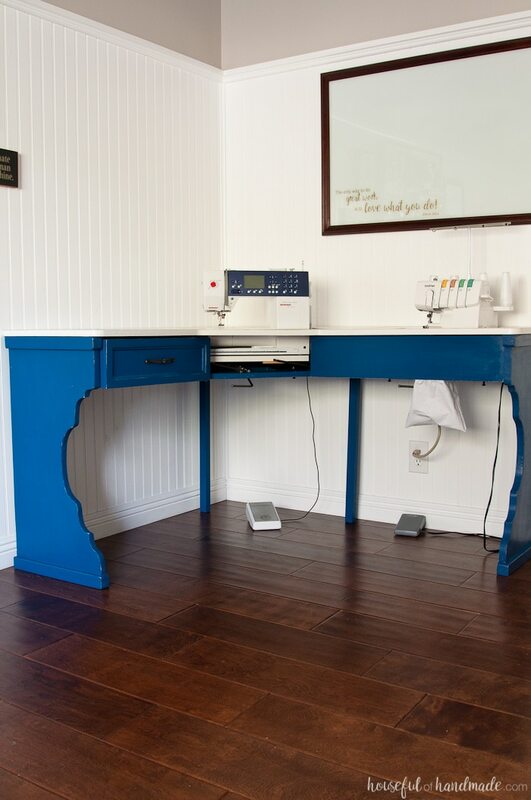 I wanted to make the utilitarian sewing machine table look like a beautiful piece of furniture. I needed to add legs that were as far from the boring brown posts as possible. 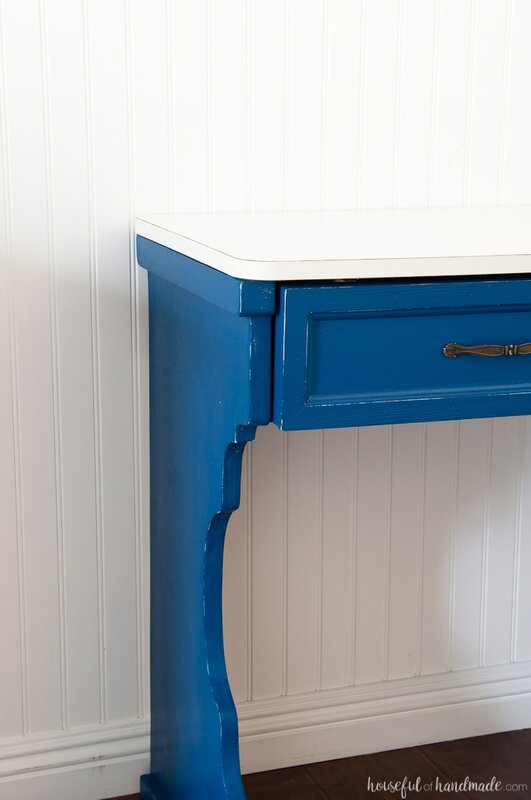 Instead of making regular desk or table legs, I decided to make legs that would cover the entire sides of the table for a truly remarkable sewing machine table makeover. And since I was redoing my entire room for only $100, I needed to be really smart about how I spent my money for this sewing machine table makeover. 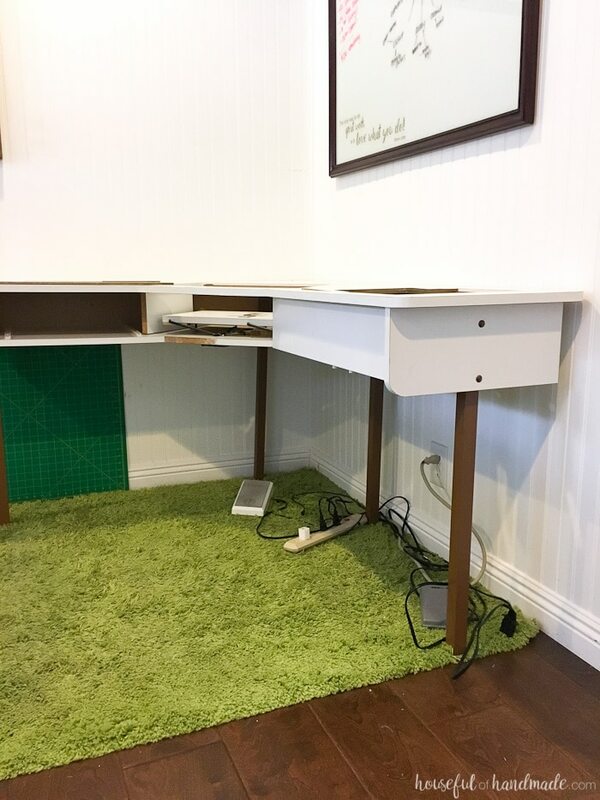 I bought a piece of 1/2″ plywood to build my closet desk area, but only used part of it. To save money on wood, I decided to use the rest of the plywood to make the legs. I also bought 1 2×2 board for $2 and ended up with the perfect farmhouse style legs for a total transformation from the posts that were there before. 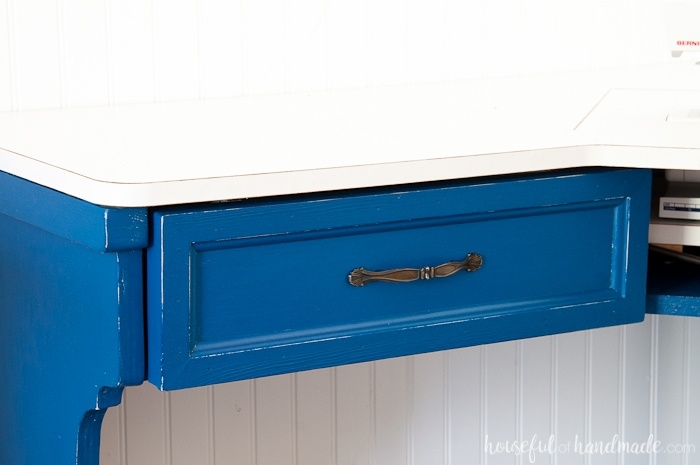 I also transformed the drawer from boring box to high-style with $5 worth of trim. After $10 of paint, this truly is a transformed piece of furniture. Hopefully it will last another 25 years and my kids will have memories of learning to sew on the same table I did (even though it’s a lot prettier now). If you have any type of table or desk that needs a makeover, you can use the same idea I did for these beautiful table legs. They were easy to make with a few basic tools. But I cannot believe how amazing they look, and my sewing machine table looks like a million bucks now! 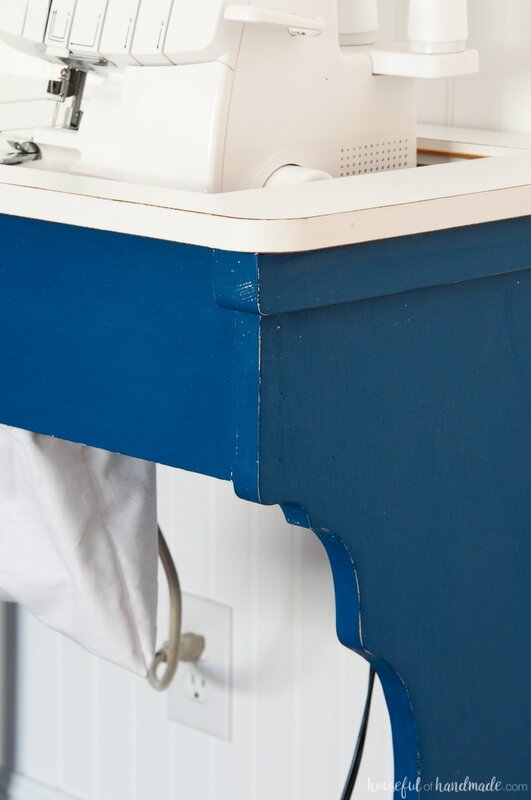 To see the entire sewing machine table makeover tutorial, click the arrow below.